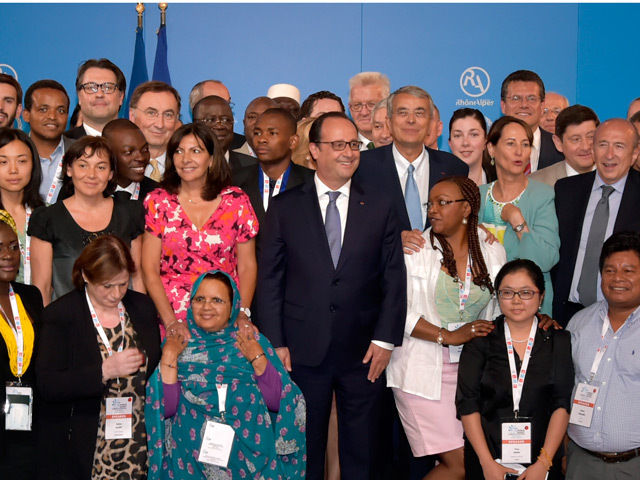 The World Summit Climate & Territories (#WSCT) gathered 800 local decision makers in Lyon, France, July 1-2, 2015. In the lead up to COP21 (the 21st Conference of the Parties)—one of the most important climate meetings of the year—mayors and community-leaders from all around the world met last week to coordinate and accelerate action at the local level. French President Hollande and his Envoy for the Planet, Nicolas Hulot, joined national and international leaders in calling upon city leaders to innovate local solutions that not only reduce carbon emissions, but also help increase resilience to a new climate. The key idea is that we need to coordinate local actions in order to create action and opportunities at scale. The cost of extreme weather events is particularly high for cities. In a study of extreme flooding in Mumbai, the highest cost came from repairs to transport infrastructure — roads and bridges. To reduce this financial risk, and make cities more enjoyable and attractive as they compete for talent, local leaders can take a variety of actions. These can include creating more compact communities, improving public transport systems, expanding public spaces, and installing green roofs to slow down water run-off. All these actions and more can help cities save money and provide better services. As Érik Orsenna, French novelist and philosopher, pointed out, mayors are at the front lines, and will be the ones who have to address the consequences of increasingly extreme weather events. But Mayors are also in a position to drive change, as they often can be much more flexible than national governments in implementing initiatives and climate action plans. For example, Geneva Mayor Esther Alder explained at WSCT how the city took action on buildings, scheduling neighborhood heating depending on the time of day and prioritizing specific sections of public lighting to operate at specific times of the day. Consolidate efforts: The amount of individual initiatives worldwide is multiplying, and while small scale activities should not be slowed down, city leaders have the responsibility to identify synergies and consolidate actions. On a complex issue like climate change with many numbers and concepts already circulating, simply adding to the amount of policies and programs that are currently lacking coordination will not allow us to tackle climate change at scale. City leaders need to combine their efforts and join forces. Use the official platform to register actions: In order to track specific commitments, companies, cities, regions, states, and investors are asked to use the Non-State Actor Zone for Climate Action – NAZCA platform. NAZCA, a program of the United Nations to track activities, relies on a set of data partners that have experience holding emissions data and tracking them over time. Local action will determine the success of our climate efforts: COP21 could produce a successful agreement, but without local action and commitments, we won’t be able to achieve the impact we need. Action at the city level is the meat on the bones of a COP21 agreement. More cities should join the 84 cities already part of the Compact of Mayors. The Compact of Mayors has significant potential, given the leadership of the committed Mayors, the strong drive from champion Michael Bloomberg, and the pressure coming from committed citizens. On the path to Paris, France will be hosting a Conscience Summit (“Sommet des Consciences” in French) later this month, which will serve as an opportunity for Hollande to show support for climate action across a broad spectrum of religions—a follow-up to Pope Francis’ encyclical. And on July 13-16, the Third International Conference Financing for Development (#FFD3) will make a strong push for opening up sources of finance at a local level. Mayor of Dakar Khalifa Sall noted that it is critical that we enable development finance to reach local governments, citing the example of the French Development Agency, AFD, as an innovator in Dakar’s development. The time is now for action. This was a common theme among speakers at WSCT. Nicolas Hulot, France, Envoy of the French President for the Protection of the Planet added “don’t stay behind a computer screen and watch the world’s demise unfold, time is now for action”. Hulot told the story of a hummingbird in the middle of a forest fire. The hummingbird was flying back and forth between the fire and the water, bringing with each of his trip a few drops to fight the blaze. When mocked by eagles, looking down on him and saying his efforts were worthless, the hummingbird answered back “I am doing my share”. Be a hummingbird. As part of its large philanthropic effort, Michael R. Bloomberg’s Bloomberg Philanthropies supports WRI Ross Center for Sustainable Cities, the producer of this blog.